Come and see my new website – Joshua Santospirito: it has a shop and information about projects and everything! Ronnie Scott and Elizabeth MacFarlane recently published an academic article in Text Journal about The Long Weekend in Alice Springs and matters to do with authorship, voice and adaptation. It’s quite a comprehensive article that I must admit blew me a away a bit with its thoroughness. This is coming up soon in Hobart, Tasmania! Five years today since the Alice Springs launch of the most emotionally difficult art project that I suspect I’ll ever do, and also the first huge art project I ever did. Grateful that I stumbled into it, completely unaware that it would change me. Recently I finished a minicomic called ‘The Tension’ which is about making ‘The Long Weekend in Alice Springs’ and what happened to me afterwards, which isn’t something that I’ve talked about much; it will be riso-printed in time for the Other Worlds Zine Fair in Sydney. I’ll have some mini launches later on once I’ve pulled my brain together. 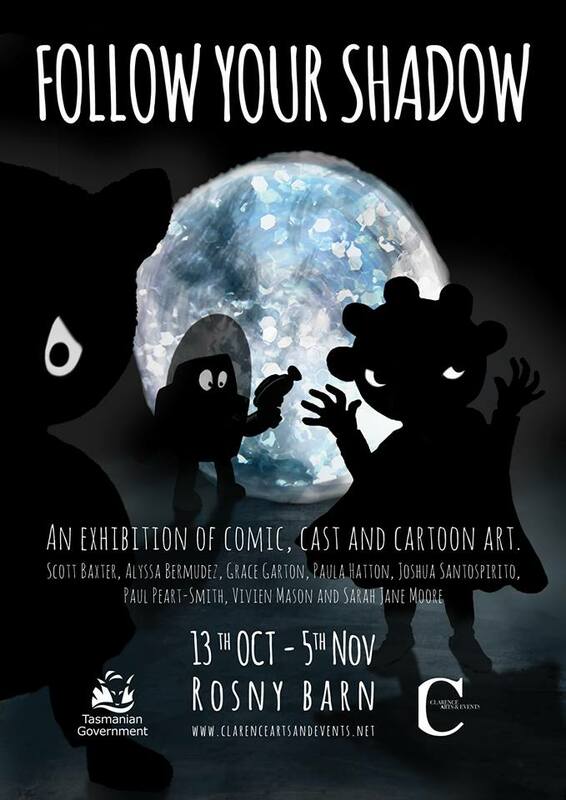 An exhibition of comic, cast and cartoon art at the Rosny Barn. With artists – Scott Baxter, Alyssa Bernudez, Grace Garton, Paula Hatton, Joshua Santospirito, Paul Peart-Smith, Vivien Mason and Sarah-Jane Moore. 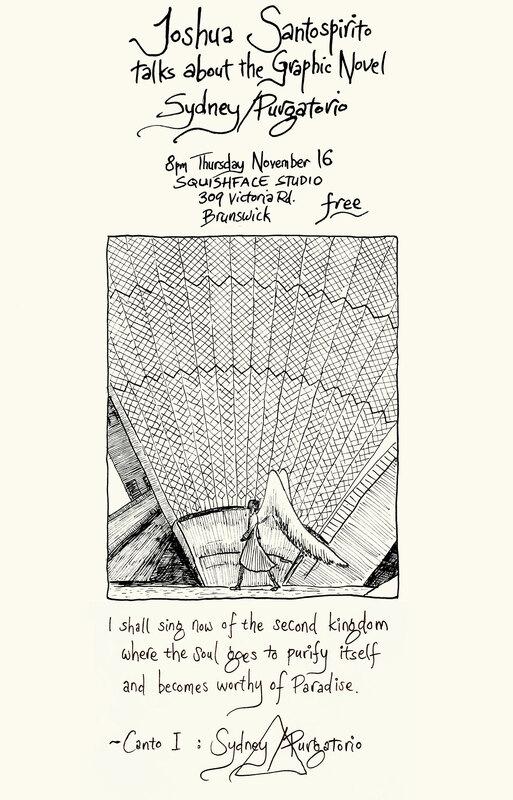 Opening – Thursday the 12th Oct, 5:30pm. Artist talks – Saturday the 14th Oct, 2pm. Student drawing competition – 13th Oct – 5th Nov.
FREE, students 18 and under. Follow Your Shadow moves between surface and source. Curated by Dr Sarah Jane Moore, Tasmanian artists Scott Baxter, Alyssa Bermudez, Grace Garton, Paula Hatton, Joshua Santospirito, Paul Peart-Smith, Vivien Mason and Sarah Jane Moore collaborate to create a magical place of mystery, animation, exaggeration and intuition. The shadows we cast are explored through object, sound and space where cartoon meets comic, graphics meet sculpture and holograms meet playful projections. From Marvel to Minions, comic and cartoon art is all around us and is increasingly being recognised as an art form with both high artistic value and the power to communicate diverse stories. Join us and follow your shadow.